Have you ever looked at a wonderful piece of art and just thought, “Wow, how did they get that so perfect?” Well, maybe it was pure talent but there’s also a chance they just traced it. 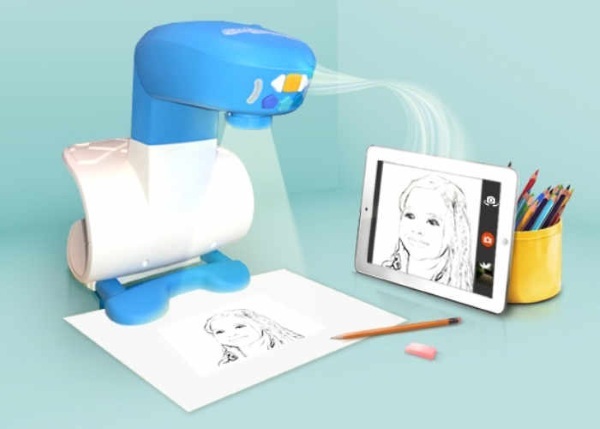 There’s no shame in that and now you can get your child to learn drawing just like the masters with the FollowGrams, the Bluetooth connected projector for your art needs. Tracing actually does help people learn to draw and great artists have used it to get the basic shape and lines down. This device is aimed at helping children recreate the things they capture on their smart phone as art. The app changes the photos into a grayscale version. This image is transmitted through Bluetooth and projected onto the paper for your child’s artistic interpretation. It can also be used to help them learn their letters by using to create a template for them to work off of. It’s an interesting gadget and it sort of bites that it’s for children, I’m sure many adult artists would love this as well. The FollowGrams is being Kickstarted by you can get your hands on one for $75. Donyae Coles – who has written 3188 posts on The Red Ferret Journal.